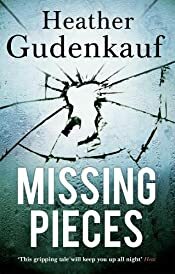 Missing Pieces is the first book by Heather Gudenkauf that I’ve read. I enjoyed it very much and will look out for her other books. Sarah Quinlan’s husband, Jack, has been haunted for decades by the untimely death of his mother when he was just a teenager, her body found in the cellar of their family farm, the circumstances a mystery. The case rocked the town where Jack was raised, and for years Jack avoided returning home. But when his beloved aunt Julia is in an accident, hospitalised in a coma, Jack and Sarah are forced to confront the past that they have long evaded. Sarah and Jack are welcomed by the family Jack left behind all those years ago’•barely a trace of the wounds that had once devastated them all. But as facts about Julia’s accident begin to surface, Sarah realises that nothing about the Quinlans is what it seems. Caught in a flurry of unanswered questions, Sarah dives deep into the rabbit hole of Jack’s past, but the farther she climbs, the harder it is for her to get out. And soon she is faced with a hard reality she may not be prepared for. The book begins with the murder of Lydia Quinlan in 1985 by someone she knew, when her son Jack was fifteen. Jack and his little sister Amy went to live with his aunt Julia and her husband Hal after the deaths of their parents. As soon as he was old enough Jack left his home town of Penny Gate in Iowa. Moving to the present day Jack and Sarah have been married for 20 years, but Sarah has never met any of his family or been to his home town. But when his aunt Julia is in a coma after a fall she goes with him to Penny Gate. Whilst the family gather round Julia’s hospital bed she begins to realise that there is a lot she didn’t know about Jack and his family, including the fact that he had lied to her about how his parents had died. The book revolves around the mystery of who killed Lydia and was Julia’s fall an accident – and if not who was responsible and why. The story is told from Sarah’s perspective as she delves into the history of Lydia’s death. I did have a few reservations about how easily Sarah managed to persuade Margaret Dooley who works in the sheriff’s department to let her see the files and records of the investigation into Lydia’s murder but Margaret is also keen to get to the truth, particularly as she had been Jack and Amy’s babysitter as they grew up and her mother and Lydia were best friends. I was gripped by this book, as more and more secrets are revealed and Sarah begins to gather the missing pieces of the puzzle. Her relationship with Jack deteriorates as she realises that he has told her so many lies, or omitted to tell her the truth. She cannot understand why he won’t talk to her and begins to suspect the worst. And then it becomes clear after Julia died that her death was not the result of an accident. I liked the setting of a small town and was fascinated by the characters and their relationships, which are intense and complicated by the reasons they kept secrets from each other. It’s a fast-paced novel that held my interest to the end. At various points as I read I became convinced that first this person and then that person must have killed Lydia, but I was way off mark. And I had no idea who could have killed Julia. My thanks to the publishers and Midas Public Relations for my copy of this book.